Every once in a while a movie will come along that demands to be seen in the theater. With the rise of 3D that began with James Cameron's Avatar, Hollywood has gone all-in on big-screen 3D theater immersion. As more and more movie-goers opt to wait for On-Demand to watch blockbuster movies at home, the studios are trying to engineer experiences that can only be had in a movie theater. 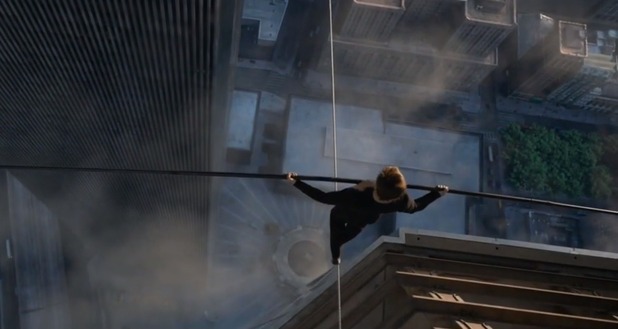 Robert Zemeckis' The Walk is the next film in a line of movies that are geared towards big-screen 3D viewing. Like the aforementioned Avatar, Tron Legacy and Gravity, the true biopic of wire-walker Philippe Petit's 1974 traverse across the World Trade Center in New York City is a film that HAS to be seen in IMAX 3D to be fully appreciated. Zemeckis (along with James Cameron) is probably the biggest technical innovator in recent cinematic history. Starting with Back to the Future and through Who Framed Roger Rabbit, Contact, Forrest Gump, Cast Away and 2012's Flight, he takes pride in pushing the envelope when it comes to visual effects. With The Walk he may have out-done himself by recreating the newly constructed Twin Towers and placing a free-flowing camera in, up and around the entire structure. The story of this film is almost secondary to the "coup" performed in the final third of the film. Joseph Gordon-Levitt (delivering lines with a very passable French accent) plays Petit as a sort of ornery acrobatic pioneer. Gordon-Levitt is able to convey the youthful enthusiasm of Petit which makes the payoff at the end of the movie seem even more powerful as a young man accomplishes a career goal. The rest of the supporting cast (including Ben Kingsley in a rather forgettable role as Petit's mentor) admirably helps guide the narrative but once Petit and his gang are in NYC, the Twin Towers themselves command the screen as the lead characters. The end of the film (after the walk is complete) becomes a sort of silent memoriam for the World Trade Center. Never before have the two towers been depicted so gloriously on-screen. With the 3D visuals you really do get to feel just how mammoth these structures were and how tied to their city they ended up being (despite an auspicious beginning in the 70's). 9-11 is never mentioned but as a viewer, you can't help thinking about the lives and memories unnecessarily taken away on that day. Zemeckis shows you all aspects of the architectural jewels that were senselessly wiped away from the canvas of Manhattan. If this type of movie at all interests you (and you can handle sensations of extreme height), then you NEED to see it (*cough* IMAX *cough* *cough* 3D) before it leaves theaters. I doubt I will ever re-watch this film as I feel seeing it at home without the three dimensional depth of a movie theater will not allow the effect duplication of being 110 stories in the air. Zemeckis (who coincidentally was born exactly 23 years before me) has added another technical marvel to his arsenal of Hollywood wizardry and will hopefully be rewarded by an Oscar. Despite some slow development in the first half of the film, the final act is WELL worth the price of admission and earns The Walk 4.5 JRs out of 5 and a spot as one of the best film experiences of 2015. Scott Cooper brought Jeff Bridges his long awaited Oscar in Crazy Heart and now he's trying to do the same with Johnny Depp in Black Mass. Depp plays real life crime-boss Whitey Bulger as we see the life of a gangster informant played out through the 70's and 80's in Boston. Depp has played a few villainous characters over his career but Bulger is definitely the darkest. Cooper brings out a great supporting cast with Joel Edgerton, Bennedict Cumberbatch, Kevin Bacon and Dakota Johnson (proving that she's ready to move on from 50 Shades of Grey). Edgerton in particular helps balance the story but I can't help think he's starting to look more and more like a Conan O'Brien clone. He plays FBI agent John Connelly who enlists the help of Bulger to provide inside information on organized crime in Boston. The film chronicles the back and forth between Bulger and that leads to the ultimate demise of the crime boss. Depp totally owns this film and commands your attention everytime he appears on-screen. He's very effective as a soft-spoken (at times) calculating villain, but I can't help but see elements of Sweeney Todd at certain times in the film. Some of his facial expressions. 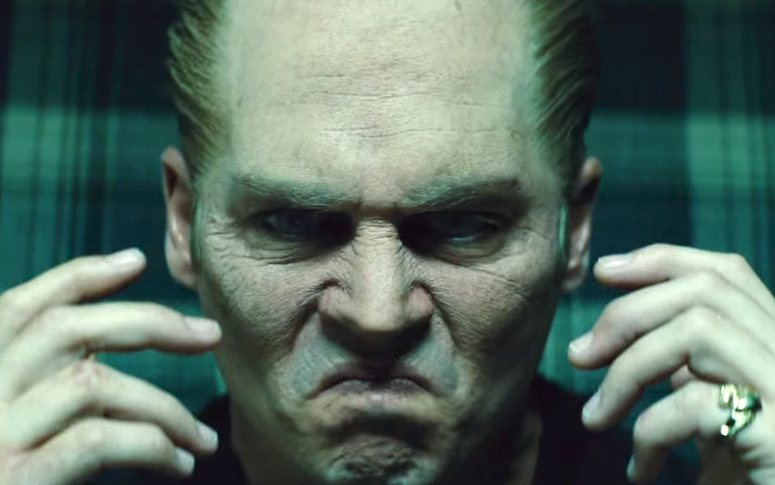 We can probably just chalk this phenomenon up to "that's what Johnny looks like when he gets angry" and leave it at that. As in Donny Brasco before it, Depp seems to be right at home in movies about organized crime. He is able to overcome some shortcomings in the script and make Cooper's film better than has any right to be. This film is enjoyable to watch but has its slow moments. Some of the fake Boston accents put on by the actors (especially Cumberbatch and Edgerton) are a little over the top. However, it is Depp's performance alone that saves this film. He is menacing, calculating and downright creepy at times. This is probably one of his very best performances and one that should earn him an Oscar nomination. I'm not sure it's quite good enough to win but we'll see next February. A solid but slightly flawed film from Cooper that earns a respectable 3.5 out of 5 JRs. You can wait for video on this one, but definitely see it at some point for a career turn by Johnny Depp. Ridley Scott makes his triumphant return to outer space with The Martian, the story of Mark Watney, an American astronaut accidentally left behind on the surface of Mars without proper supplies or food and the coordinated rescue mission that is launched to save him. Scott most recently left Earth in 2012 to film (the is it or isn't it Alien prequel) Prometheus and Matt Damon (who plays Watney) left Earth just last year in Christopher Nolan's Interstellar. Scott gathers a cast of A-List actors to assist in this action/drama/comedy and we are left with an entertaining, but not totally satisfying motion picture. This story of bringing an astronaut back to earth is adapted from the book of the same name by computer scientist Andy Weir. Weir's plot helps fuel the narrative as we are thrust between Mars, Mission Control and various labs and research locations as all of NASA attempts to work together to solve a series of problems. Damon becomes the focal point of this film and like him or not (and I really do like me some Matt Damon) you're stuck with him for nearly 2.5 hours. 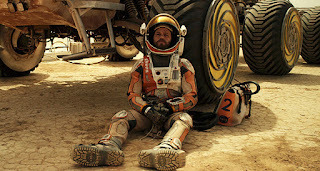 His portrayal of Watney comes across a little smug and not totally likable. He really does give a complete performance (especially since he's on screen alone so much) but I don't really think it's his best performance of his career and one that does not really deserve Oscar attention. The best part of this film is the visuals of Mars and the way Scott is able to show how vast and desolate the planet is. Shot on location in Jordan (sweet!) we get to see large wastelands of red terrain that make it seem even more impossible that someone can survive on Mars for two years by themselves. Scott brings the tension through a constant check on the date (mission days are referred to as "sols") and through scientific calculations that force decisions to be made quicker than folks at NASA are comfortable with. He manages to keep the pacing solid, making the long film go by a bit quicker than you would imagine. Scott also expertly weaves a fragmented set of locations and characters, keeping the audience interested at all times. You can tell Sir Ridley is just VERY comfortable shooting films set in outer space. I definitely didn't LOVE this film (and I really wanted to). It was very entertaining and most of the acting is great (Chiwetel Ejiofor gives the movie's best performance and he really is due for an Oscar one of these years). It just didn't really move me like Gravity and Interstellar did. Both of those space films were more complete in my mind and I thought the journey to the far reaches of space that Nolan brought us felt more epic and tense than the effort to save Mark Watney. We also got to know the main characters in those films a bit more through character development and back story. I really wanted to see Sandra Bullock and Matthew Mcconaughey survive their space adventures, but if Matt Damon didn't make it back I really wouldn't have been that broken up about it. Another problem I had was with the shear scope of the cast. Ejiofor, Damon, Jessica Chastain and Jeff Daniels were all acceptable in their roles, but adding on countless other stars in Kristin Wiig, Kate Mara, Michael Pena, Sean Bean (who is in a hilarious scene that mentions Lord of the Rings) and even Donald Glover (who seemed to be randomly forced into the film). Sometimes less is more (hell, Gravity really only had two actors) and in this case I don't think all of these stars (especially Wiig and Glover) were needed. I actually enjoyed Prometheus a lot more than this film, probably primarily because the tone seemed more dark and serious and there were just too many corny moments mixed into The Martian's plot to keep me fully invested. That being said, this is a very good movie that needs to be seen on the big screen. Shot in 3D it was effective to watch this with glasses on as well (especially the scenes in space towards the end of the film). I hope Ridley Scott keeps sticking to his science fiction roots which has become a sweet spot for him at his advanced age (77). I am excited to see that Hollywood has fallen in love with outer space exploration once again and I hope we'll continue to see well-told stories of space pioneering on the big screen. Teetering between 3.5 and 4 I'll give 4 out of 5 JRs for a flawed, sometimes hilarious but still very exciting space epic. It's Ridley Scott and not Matt Damon that make The Martian work for the most part. Stay tuned for my next review of Robert Zemeckis' The Walk (IMAX 3D) which I plan on seeing later today.